The man allegedly threatened and assaulted Burien Mayor Jimmy Matta Saturday at the annual Olde Burien Block Party. A 62-year-old man turned himself in to police late Monday in connection with the alleged attack on Burien Mayor Jimmy Matta for his political support of Latino immigrants, the King County Sheriff’s Office announced Tuesday. About 9 p.m., the man walked into the sheriff’s Southwest Precinct, where deputies fingerprinted and administratively booked him for investigation of malicious harassment, Sheriff’s Office spokesman Sgt. Ryan Abbott said Tuesday. The man was released late Monday, Abbott said. Detectives are preparing to forward a case to prosecutors for review later Tuesday, Abbott added. The Seattle Times is not naming the man pending formal charges. The man allegedly threatened and assaulted Matta on Saturday about 7:30 p.m. while the mayor attended the annual Olde Burien Block Party. Matta said the man approached him from behind, put his arm around Matta’s neck and pulled him down, scratching Matta’s arm on a fence post and drawing blood in the process. “He came around the back, took his arm, wrapped it around my neck and brought me down and started talking in my ear,” Matta told The Seattle Times. Matta said he recognized the man as someone who had confronted him at least twice in the past to criticize Matta’s political stances on Latino immigrants. Matta reported the incident to deputies at the block party and gave a formal statement to a detective Monday, Abbott said. Detectives are investigating the attack as malicious harassment, under the state’s hate-crime statute, Abbott said. Matta, elected to the City Council in 2017 after a racially charged campaign and later chosen by council members as Burien’s first Latino mayor, has been a vocal supporter of Burien as a so-called sanctuary city, a jurisdiction that limits its cooperation with federal immigration-enforcement actions. 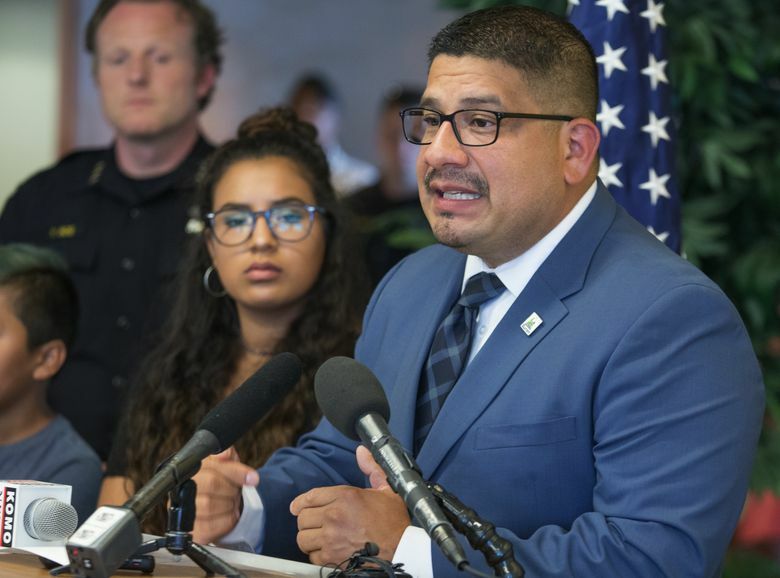 At a media briefing Monday at Burien City Hall, Matta said he reported the incident to serve as a model to others in the Latino community who may be afraid to report threats or assaults against them.